Welcome back from lunch! I hope it was as delicious for you as it was for us here at SMX West. Because, oh boy, it was yummy. Up on stage we have a fine list of speakers who are going to teach us how to differentiate or die. We have my partner in crime (and business) Rhea Drysdale, Eric Enge, Casie Gillette, and Hugo Guzman. Eric Enge just came out from behind the curtain in a mask and a weapon. No, really, that happened. Look. Do you see what you’re missing by NOT being here? It’s craziness. Eric has an actual presentation. He’s not just here for the mask bit. Ready for him? Eric says that there are almost 8,000 results for the phrase [lathe operation]. He thinks that’s somewhat crazy. I mean, how many pages do we really need? Obviously not that many. He shows a search query for [credit cards]. The number one ad result is a Google-controlled page. Above the fold there is one organic result. If you look at the top ten results it’s huge brand names. Only important brand missing is AMEX. There are 43,000 results for [how to make french toast]. That’s how many people are competing. But how many results matter? Maybe two. Maybe one. If Google gets the rest of the results wrong does it really matter? He says no. Now we have Search Plus Your World. Do a search for [cars] and there are 3 results from Search Plus Your World and more ads. We only have four non-ads above the fold and three of these come from a ranking algo that did not exist prior to January 12, 2012. The Seismic Shift Will Continue. Eric says the PC may be gone in a year. MY DELL! We’ll be living in the cloud with iPad-type devices. The browser may fade and we’ll be living in a world of apps. The impact of social is already so huge that Google is pushing down their own ads for Search Plus Your World. They gave up revenue for it. That’s how you know it really matters. How are you going to be one of the four? You really want to be in a position where if you don’t show up in the search results the search results are WRONG. That’s the position where you have a long-term business. He’s going to throw out some ideas. None, he says, are particularly revolutionary. Be the purple cow: That’s the cow you talk about. It’s remarkable. Brand searches: If the major ads aren’t showing up for the search results where they apply, those search results are wrong. It’s all about trust. The goal is to become so important that the search results are broken if you’re not in the top four. She introduces us to Fred. Fred is a sea cucumber. Yes, we really are going to talk about sea cucumbers. Welcome to my entire relationship with Rhea. Rhea says that Fred’s defense mechanism is that he throws himself up. Honey badger thinks that’s nasty [so do I]. She agrees him. The sea cucumber teaches us that if you want to survive you must evolve. As an SEO, we have to evolve to new technology. The sea cucumber evolved while still looking like a sea cucumber and moving as slow as one. We can do it too. We are smarter than a sea cucumber. And if you’re not, well, then you have other problems. One third of the world are visual learners. Rhea is a visual learner (I’m not). If you talk to her, she won’t remember anything you said (I can vouch for this). Additionally, 30 percent prefer visual-spatial learning styles. Google picked up on this when they released Universal Search results. There are images up at the top, there’s freshness in news, there’s other media, etc. The search engines are getting smarter. Now there are advanced related searches. If you search for a spa, you’ll see stores and brands. Search engines are getting smarter and updating faster. Google is now talking about its algo updates every month. Page Titles – do you meet user intent, as well as query intent? Google classifies queries as informational or transactional. Meta Descriptions – Make sure your Meta Descriptions are fitting within the length so they don’t get truncated. Images – Optimize images, optimize content around them, make sure they’re crawlable. Consider that certain images that are ranking for competitive terms will get more clicks if they stand out. Videos – Publish your videos on your own Web site. News – If you’re trying to rank for competitive keyword, work yourself into news results. Make sure you’re crafting news and optimizing news. It doesn’t have to be mainstream. 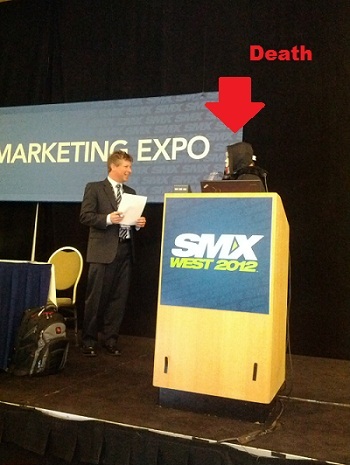 Rhea shows a search for [SMX] and all the blog “news” sites. Reviews: On a product or an aggregate level. Do a rating for your content, it doesn’t have to be a product or location. Site Links: These are a big deal. As a user they’re a big brand indicator. If you’re getting site links, it’s a good thing. Google+ In Sitelinks: Allows brands to totally dominate the search results. Advanced Image Optimization: You can create an image in the search results. You cnn make up images and have them appear in their search results. Next up is Casie Gillete. It’s all about sharing and interaction and getting people to actually DO them. We talked a lot about video. Over the past three years they’ve developed three different videos. Not one of them was a product video. Everything’s based on the idea of entrepreneurism. There is zero mention of their brand. Their videos have given them 2.2 million views, 130 press mentions with links back to their site, people tweet about it every day, their one video is three years old and it’s still being tweeted. When you search for grasshopper.com one of those videos does come up. No one wants to talk about your phone system. You need to make them want to talk about your company. Identify customers you already have a relationship with. You can’t force peopel to share, but you can help your chances. We get so caught up in what we’re doing and our tactics that we forget to look around. We have this network of people that we can actually utilize. They focus on co-marketing. She reaches out to other companies with similar ideas and they figure out how you can promote one another. What are the results of all their work? They ask people how they heard about them as a way of quantifying what they’re doing. I have a girl crush on Casie. She was awesome. Even more awesome in person.